This is an interesting area to look at and address, as I am frequently asked about this. In my work as a dog behaviourist, I see simple over exuberance right through to a standard poodle that I remember leaped on my back with all four feet (at the same time!) as if in a circus show as I walked along the hallway into the lounge as I entered the home…I very nearly fell forward on my face! Another story for my amusing anecdotes book one day. How do dogs greet when they first meet up? I see no kissing, hugs, maybe a nose rub if I'm lucky. Most dogs are far more cautious when meeting each other cold, and will curve into each other and sniff the opposite ends quite often. One dog may sit down, or become submissive and lie down. It varies a good deal depending on the confidence/dominance levels of each dog. Owners can be flattered by an over exuberant dog upon homecoming, and fan the behavioural flames even more by rewarding over the top displays with high pitched voices, dropping to the knees and hugging and so on. The point is then that we both have different ways of meeting and greeting as two distinct species. We often encounter complications when we try (and expect) the dog to meet us in a human way, and not in keeping with its own kind. As we are (supposedly) the more intelligent of the two species, we shall need to adopt the way of the canine and not of the human when greeting, and to try and save ourselves getting the dog too worked up upon initial greetings. Ignoring the dog initially (in fact I call this a deferred greeting) is simply advised to manage the dog's behaviour and expectations. I do not suggest it because I believe we live with wolves, and the leader ignores upon reuniting. We live with dogs, not wolves. The best advice I can give is to turn the heat right down on your greetings ritual, and to actually ignore until the dog is calm and ready for a greeting that is controllable and more relaxed. I send my two dogs onto their bed just before fuss and they are asked to sit as I give calm affection. We're all happy that way. 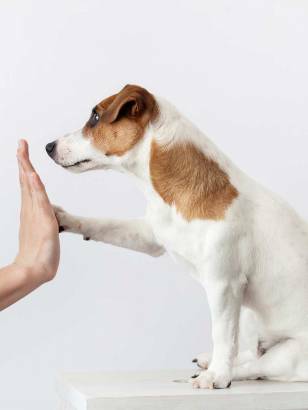 Asking them to sit for the greeting is ideal as the dog will be less likely to jump and become overexcitable. If they break that position and become too excited, then again go back to the ignore until they are ready to be sat again. Be consistent and determined in your approach, and things should settle quite nicely. It's a matter of self-control for us as humans, and guiding the dog's behaviour into a better place through us managing our own impulses. Even these steps may not be enough for the most ardent dogs when you come home, so we'll need to talk to introduce further management measures. 'Management measures', now there's a term I should patent.